What the River Mersey at Otterspool may lack in scenic beauty, it certainly makes up for with the quality and convenience of fishing on offer. It is a venue that provides a realistic chance of a double figure cod, and good bags of big whiting throughout autumn and winter. The prom is comfortable to fish from as there is no moving about with the tide needed, and there are street lamps overhead and railings which double as a rod-rest. 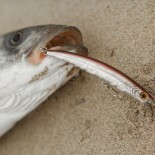 Best bait is crab for the cod (if it’s allowed and if you can get it! ), and lug and mackerel for the whiting. Maddies will catch any bits found in close. Unfortunately the fishing was slower than normal this year due to the fresh water running out the estuary, but despite this there were still some good fish caught with Pete Corker’s 12lb cod being the highlight. Some reasonable bags of whiting also showed in the high numbers on the second day. 1. George Smith (Grimsby), 122 cms, 1 codling, 1 cod, 2 whiting. 2. Ian Brookes (Birkenhead), 93 cms, 2 whiting, 1 codling. 3. J.P. Molloy (Clonakilty), 92 cms, 2 flounders, 1 codling, 1 whiting. 1. Mike Emery (Onchan), 224 cms, 6 whiting, 2 codling, 1 dab. 2. Peter Corker (Pentre Halkyn), 200 cms, 3 codling, 1 cod,1 whiting. 3. Michael Brookes (Birkenhead), 127 cms, 2 codling, 2 whiting. 1. Ian Reynolds (South Benfleet), 234 cms, 7 whiting, 1 codling. 2. Simon Dawber (Orrell), 175 cms, 3 whiting, 2 codling. 3. Dave Roe (Dublin), 134 cms, 3 whiting, 2 flounders. 1. Stephen Brennan (Dublin), 212 cms, 4 whiting, 3 codling, . 2. Ged Stevens (Barrow-in-Furness), 165 cms, 4 whiting, 1 flounder, 1 dab. 3. Shaun Golightly (Tyne & Wear), 164 cms, 6 whiting. 1. P. Corker, cod 83 cms. 2. G. Smith, cod 69 cm. 1. Garry Hutson (Grimsby), 285 cms, 7 codling, 2 whiting. 2. Kevin Barber (Sligo), 187 cms, 4 codling, 1 flounder, 1 whiting. 3. S. Dawber, 138 cms, 3 whiting, 1 flounder, 1 codling. 1. Shane Russell (Colwyn Bay), 230 cms, 5 whiting, 2 flounder, 2 codling. 2. S. Brennan, 228 cms, 6 flounders, 3 whiting. 3. Ian Rycroft (Isle of Man), 212 cms, 5 whiting, 3 codling. 1. Bill Lindfield (Greasby), 480 cms, 10 whiting, 8 flounders, 1 codling. 2. Garry Reid (Isle of Man), 414 cms, 13 whiting, 1 dab. 3. J.P. Molloy, 286 cms, 7 whiting, 2 codling, 1 flounder, 1 dab. 1. Chris Stringer (Whitley Bay),456 cms, 16 whiting. 2. M. Brookes, 434 cms, 15 whiting, 1 flounder. 3. P. Corker, 422 cms, 11 whiting, 2 dabs, 1 codling. 2. I. Reynolds, cod 58 cms. 2. Peter Corker (Pentre Halkyn). Cheers Paul – i may have been a tad lucky! Good work Stephen,well done.long time no see,how are you? Thanks Neil. Its been a while alright – i’m still trying to do a bit when i can! Cheers Stephen for the report and weldone on the win. Thanks Keith – you’ll have to give it a go next year! This entry was posted on December 14, 2012 by steve and tagged Irish Sport Fishing, N.W.A.S.A.C., Otterspool Fishing, Pete Corker fishing, River Mersey fishing, www.irishsportfishing.com.